You can use most any cut of meat when making a roast beef. I have used anything from a rib-eye roast to a rump roast, a sirloin roast, or even a chuck roast. All of these cuts taste quite good. Often my choice depends solely upon what is available for sale. This last week it happened to be that ribeye roasts were on sale. These are also known as standing rib roasts when the bone is left in the roast. Learn how to cook to a ribeye roast. So years ago I was a co-manager at a Kroger store. During my training, we received a fair amount of training within the store. I spent a month working in the butcher shop. It was there I learned about different grades of meat. Typically in the grocery stores, you will see three different grades of meat, those are select, choice, and prime. Prime grade beef is the beef that is the highest of quality. The fat marbling is throughout the meat. Prime beef has a lot of marbling throughout the meat, less than 5% of all meat is graded prime beef. The next best grade of beef is the choice; it has less marbling than Prime but more than Select. What I honestly like to do is to watch when meat goes on sale is to look at what grade of beef it is. I like to compare the price of Prime and Choice grade beef, if the difference is small, I will choose the Prime beef. It is the fat that gives you the flavor as well as the ability to make gravy and Yorkshire pudding. There is a lot of discussion around how to season a roast. If you want to marinate your roast, you need to do it a couple of days in advance. It takes times for the flavors to penetrate past the outside surface area of the meat. If you are going to take the meat from the package and cook it, your options are more limited. The flavors you add aren’t going to make it all of the way through the meat. The old standbys of salt and pepper will do the job for you. 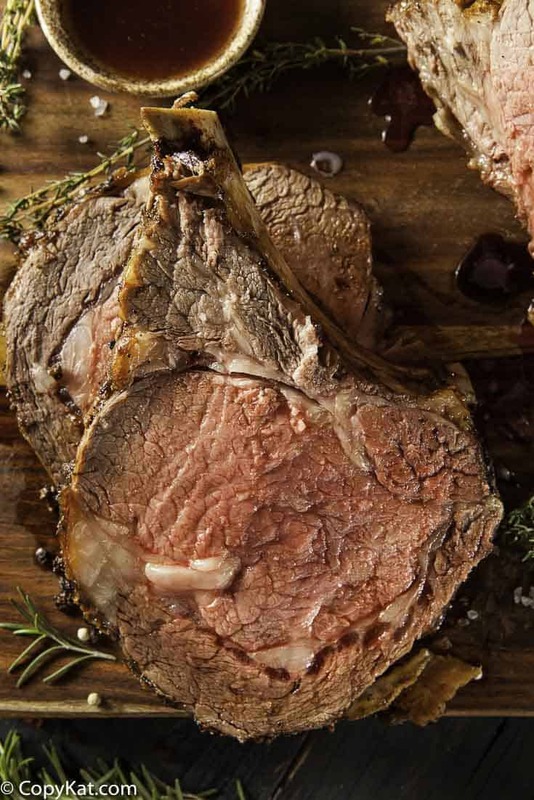 You can always serve your roast with beef gravy, Au Jus, or a wine reduction sauce. There is no need to worry about getting a particular seasoning together; I promise salt and pepper will do the job quite well. You can sear the beef if you like. To searing can help brown the roast on the outside. Some people believe this gives the roast a better flavor. I am not fully certain if it enhances the flavor, but it definitely makes the beef look wonderful and brown. To sear the beef, I suggest using an iron skillet. I add some oil the pan, a good tablespoon, I like to use an oil that has a high smoke point. So something like canola, or your generic vegetable oil will be perfect. Fancy olive oil tends to smoke at a lower temperature, so it isn’t ideal in this use. Season the meat, and put it into the hot skillet with the hot oil. Let the meat rest there for a couple of minutes on each side. If you try to move the meat around initially, it will stick. It is counter-intuitive, but wait, when the meat is brown it will let you pull it to flip it on the other side. Continue this process until all sides are browned. This step is not necessary for this recipe. Why would you truss a roast, you can truss a roast to help force it into a more even shape? This will help cook the roast evenly evening. It also can make the roast easier to slice when it comes time to slice the beef. Did you know that often you can ask the butcher to truss the roast for you? You can also truss the roast yourself with some butchers string that is sold in most grocery stores. 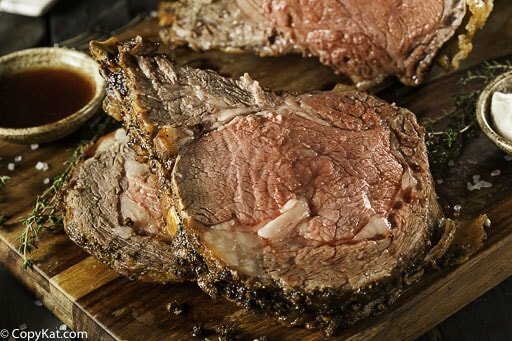 You can make delicious roast beef in the oven. To prepare the meat remove from the refrigerator 60 minutes before cooking. This will give the roast a chance to reach room temperature. Preheat oven to 325 degrees. If the roast is very lean you may want to drizzle a tablespoon of olive oil or two over the roast. Sprinkle salt and pepper over the roast. Place the roast on a wire rack on a baking sheet. Bake the roast for approximately 25 to 30 minutes for every pound of meat for a roast to be cooked to medium. Adjust accordingly for your preferred level of doneness. You should use a meat thermometer to determine when the roast is done. Push the meat thermometer all of the way into the center of the roast. Pull the roast from the oven when the inside temperature of the roast is about 10 degrees less than your desired level of doneness. The temperature of the roast may rise while the roast is cooking. Let the roast rest for at least 15 minutes, tented in aluminum foil to keep warm, before carving to serve. So if you want a medium rare roast remove it from the oven when the internal temperature reaches 120, it will rest for 15 minutes. The internal temperature will rise while the meat is resting. It is always best to use a meat thermometer if you have one to ensure you cook the roast to your desired level of doneness. PLEASE NOTE: Your cooking time depends on the size of your roast. I tried this for the first time today. Was so easy to follow. My husband has been put on a low sodium diet which means I can’t get his deli or prepackaged meat for lunch sandwiches. I used zero sodium spice only before and after I sered it. Was still very flavorful. Thank you so much. I am glad this worked out well for you! You need to note how much your roast weighs and then determine your time. I will email you a chart I created. To cook the perfect prime rib place in oven at 375 for 45 minutes. Then turn the oven off. DO NOT OPEN the door. Let sit for two hours in oven. Then turn oven back to 375 for 45 minutes. This will give you perfect medium rare every time no matter the size of the roast. This is for rib bone removed roast. The best marinade is to completely lather the roast in djon mustard before cooking. Have done this for Christmas for 20 years on 5-10 lb roasts depending on the size of the company coming and your friends will simply not believe how perfect it is. This is the recipe I was looking for! I’d seen and used one from a Colorado junior league cookbook I had many years ago. Thank you! VERY TASTE AND EASY TO PREPARE.. THANK YOU FOR SHERING THE RECIPES. GOOD JOB. 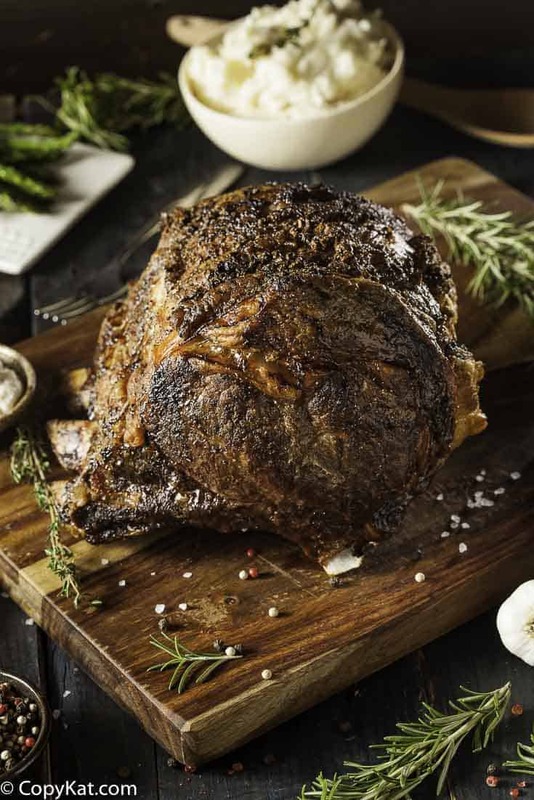 I’ve never cooked a roast in the oven that wasn’t like shoe leather and dry…so, I’m thrilled beyond words to try your tips and suggestions on what meat to buy and how to cook it correctly! You had me at “something about slow roasted roast beef that is so hard to resist”. I, too, love a good pot roast in the crockpot, but I am longing for slices of that crustly beef outer coating. This recipe was just in time! I have 2 roasts my husband bought, which he said he wants me to roast the old-fashioned way. I cant’ hardly wait to try this. Thank you thank you! I hope this recipe works well for you. A happy and healthy new year to you Ms. Stephanie!